People, if you don’t have a muckraking, bottom-feeding, Rupert Murdoch-owned tabloid in your town, you don’t know what you’re missing. You take one trashy story, some cheap Photoshop effects and the next thing you know, you have journalistic gold. 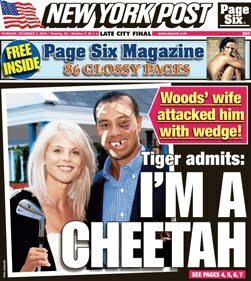 Tiger Woods is in the middle of a major life crisis and what does the Post do? They mark up a photo. It’s juvenile. I approve! I especially like how they inserted a 5-iron, her weapon of choice, into his wife’s hand. There’s something perverse about it. Hitting Tiger with a golf club is like Bruce Springsteen’s wife hitting him in the nuts with a guitar or Stephen King’s wife smashing a typewriter over his head. Tee-hee. This has Pulitzer written all over it! Mad: Aren’t you one of Sid’s partners in crime? Welcome! The words “New York Post” and “Pulitzer” are never used in the same sentence.Bob: I had help. Nurse: Wedge. Iron. Whichever. She achieved the end result she was looking for. Today, it says they’re “renegotiating” the pre-nup. Now THAT’S a beating! I saw another version of the photo that had a golf ball stuck in his hear. But I must say that I’m really disappointed in him…I love to watch him play golf–he does some amazing things. I won’t be quite as happy watching him win in the future. His balls really did land him in the rough this time. So much for his skill over the latest birdie. HIF: I’m sorry you’re feelings about Tiger have been compromised but at the end of the day, these guys are all human except with better PR management.Jimmy: Metaphor city.Daisy: If you don’t already have one I can assure you there’s an audience and a need for it. i’m getting pretty tired of reading about celebs, so whenever someone can add the ‘strange and obtuse’ to the writing style, it makes it fun again! but, always, taken with a grain of salt and the tongue embedded firmly in the cheek.